How do I use Beamman’s SoftSmoke? I loaded the effect, but it’s just a black blob! How do I control it? Beamman’s SoftSmoke is another example of an effect controlled by a .pmd/.pmx model. To use the effect, you load both SoftSmoke_SP.x and SS_Controller_0.pmx into MMD. The former controls effect’s position in the world, the latter – everything else. The controller model is Japanese only though, so you better translate it to English before using. After loading the .pmx controller into MMD, you get multiple ways of modifying your blob of smoke. Shrink/Grow/X/Y/Z sliders allow to change its size (the effect can be rather taxing on weaker video systems, so I’d recommend you to minimize it first and then decide what size should it be). Hue/Saturation/Lightness/Transparency group governs smoke’s color-related properties. Density and Puff size changes the amount and thickness of individual “puffs”. Moving speed and Puff dynamic determine how fast puffs raise and traverse respectively, and Puff speed is about their “life cycle” from conception to dispersing (you must be in play mode to see effects of those). 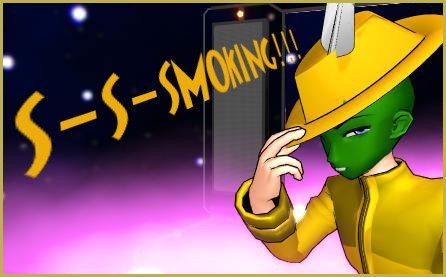 “The Mask” model used in the illustration is composed of recolored Animasa’s Kaito and Pimp Hat by Swiftcat-Mooshi. Also Trackdancer’s LearnMMD Stage was (under)used. What happens when you load other effects? Do they work? They work but, I found out it was an older version of the effect. There’s a 2nd one on the DL’s site and it….somewhat works now. Thing is, a problem still occurs…. I tried searching and trying different ways of fixing this by using videos on Youtube and an Intel site to download drivers but, this STILL happens. What is your video card, for that matter?